You are here: Home > What Is The Samsung SGH-T879? Could It Be The Galaxy Note For T-Mobile? What Is The Samsung SGH-T879? Could It Be The Galaxy Note For T-Mobile? So here’s the thing, we can’t absolutely, positively say that this user agent string and the Samsung SGH-T879 model number is a T-Mobile variant of the Galaxy Note. What we can say is that there isn’t another Samsung device on the market with a screen resolution of 800 x 1280. We can say that SGH-T8x9 is normally reserved for tablets. 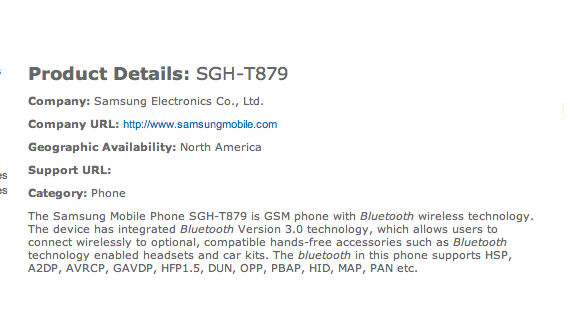 We can say the bluetooth doc relating the SGH-T879 originally called this a variant of the SGH-i717 which is…the AT&T Galaxy Note, unfortunately that comment has since been removed. Also, AT&T’s exclusivity on the Note ends this month. Before we go on, a quick reminder, Samsung/T-Mobile devices are always SGH-Txx9. 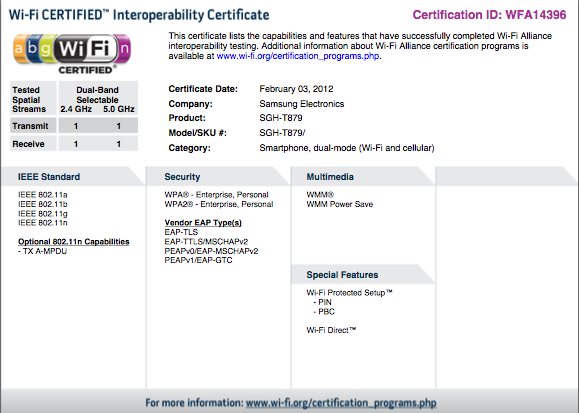 That’s how we know when a Samsung/T-Mobile device passes through the FCC. So why do we think this is the Note rather than another Galaxy 10.1″ tablet? The bottom line is we can’t say with 100% certainty that this is the Galaxy Note. It’s possible we’re looking at a 10.1″ tablet follow up to the current T-Mobile Galaxy Tab. However, the use of the word “phone” contained within the Bluetooth Sig and Wi-Fi alliance reports has us hoping and believing that this very well could be the Galaxy Note. Whatever this is, we know it’s coming to T-Mobile, that much we know. Thanks to Conan Kudo for contributing to the report! A Samsung rep hinted to me about a month ago that T-Mobile would be getting the note. Although I was also told that AT&T had the exclusive for another 90 days or so. Take it with a grain…or maybe a whole shaker of salt, but it’s what I was told. I was told by a rep in a TMO store about a month or so ago that they would be getting the Note soon too…. how many times does it have to be said here…. reps know NOTHING about upcoming phones. we find out from here!! orly? FUT trials are fun….especially since i’ve been using a One S for about 3 months. RSL to be exact. Retail knows more than you think….or well at least our store does considering its a staff of nerds. Ok………… You must be one of those reps who think you know everything because of rumors reported on tech blogs. I am an rsa and get no information on anything before tmonews gets it. It’s all about building relationships my friend. We have a strong relationship with each vendor. Not just during their visits. Also, knowing the person(s) who handle the FUT. Delivering good feedback and reports to them set you up for another device immediately. Don’t assume…because that just brings you to hate me. My brand reps must play stupid then. They never know of upcoming devices, even when they are leaked on here. If somebody store level knows about a device, tmonews knows. I’ll leave it at that. You can keep touting your superiority. whatever helps you grow your E-peen. That can be taken in several different ways. Are you saying that store level reps “leak” info on the spot? Some of us have more integrity than that. I’m not trying to be superior in any way. Just stated that some retail employees know more than you think. You resorted to pointing fingers. Thats a great move for tmo. Now just hoping that tmo goes for the htc one x! Never understood what’s so good about the Note. I got to see that phone in person and its insanely huge. You might as well get a tablet. Plus it has touch wiz. Still waiting for either an iphone or new new nexus. (Coming from samsung tab 7 inch btw)..so I speak from experience. I never understand why people have to impose their likes on others. I think a 5″ phone is perfect for people who like large screens with high resolutions. I cant even use an iphone I have large hands which makes the tiny pathetic screen hard to use. I thought that until I used it. There is something addictive about the Note. I didn’t like Touchwiz (or any skin), but the newest version of Touchwiz is less intrusive than the one on the Vibrant. Once I went into the AT&T store to play with it, I had to have it. Even though I’m no longer using it as a phone, it makes for a great smaller tablet. Back on Feb 27 I swear we saw a T-Mobile branded white Note in the wild (in a grocery store in Bellevue WA – very close to T-Mobile HQ). It was large and clearly branded with T-Mobile logo on the top and a Samsung logo on the bottom. At first we didn’t think it was a Note because the logo placement didn’t match the international Note pictures. However, once we saw the picture of the AT&T version, it was a dead ringer with the T-Mobile branding where the AT&T branding was. Can’t wait for this phone. Hopefully it will be available soon. Fortunately, T-Mobile has been keeping very quite about upcoming phones until close to release time. Maybe this bodes well for the T-Mo Note. Why didn’t you take a picture of it and post it here? That would’ve been a great leak. I couldn’t get a pic at the time. She was on the phone and I only got a glance at it when she put it away. I did tell David via twitter at the time. I got to Play with a Note and I dug it although not a Huge fan of TouchWiz I did like the Note and would seriously consider upgrading to it! please be the galaxy note, im really interested in this device a lot, this or the gnexus or the gs3..
tmobile might also get the galaxy nexus, ATT is getting it , i read that tmo might too.. I would have been happier if it was the Galaxy Nexus. The Note is cool and all.. but, it’s just not for me. It will be rather easy to sell though! If it’s the Galaxy Nexus…..that would go a long way towards grabbing some mindshare again. TMo needs more “Best of class” phones, not “well we have this instead”s. They need things like the Galaxy Note, the GS 3 ( to be on the premier carriers list to receive it first ), and the OneX…..Frankly, I’m wondering why more hasn’t been made about the LG 4X HD ?? Hello ?! G4X anyone ? a “well it’s almost as good” a little at a time versus subsidizing FLAGSHIP phones and bringing people IN, will save the business. Apparently everyone hates the note, until they use it for a week and never want a smaller size phone again. Very interesting if so there will be some happy campers around here. This is the phone I thought I would replace my vibrant with long ago before I lost all faith in samsung. I’m not buying the HTC, iphone or any brand without a sd slot. So to keep my vow not to buy samsung products I might just wait to get this or the Gs3 free. Problem is now adays they add so much local & fed taxes & bs mandated fees I can save $500 going through walmart’s plan vs a t-mobile contract. So it will cost what at tmibile? $300 after 50 rebate? $300 down with 20 dollar eip? Lol. If TMo pulls this sort of switcheroo….it WILL backfire. After losing 600K postpaids in 1 quarter, to release the OneS ( after rebate ) at the same price as the OneX for ATT, is ridiculous. TMo has to get with it that to get customers, it has to ATTRACT customers…..you don’t attract customers with “Middle of the road” phones. You might keep some people who don’t know better….but you’ll never grow your business with that mentality. I would probably be in the rankings of paying retail if this came out on t-mobile. Yep it’s coming, and faster than we know. My contract with T-Mobile expires in January 2013. If this is the Samsung Galaxy Note for T-Mobile with Ice Cream Sandwich and the Premium Suite by then, it WILL be my next phone. But I want it to be the ICS version, not the Gingerbread. (I have Gingerbread on my current T-Mo phone, and while I love it, I’m tired of 3.5-inch anything. Flip it to a 5.3-inch Note, and I’m back with T-Mo for another two years. Or this could be like the SGH-T999. Get us all excited, and then never rear its head again. Yup with news of stuff like this coming to T-Mobile, to hell with the One S. I love my Sensation, and I was hoping T-Mobile would get a high end HTC phone. Maybe I’ll trade in my Sensation for an Amaze to hold me over. Good luck with that….I’ve about given up TMo getting a high-end HTC ( or Samsung, after the GSII switcheroo )…..if the 879 ( which I really think it’s another mid-end rev ) is the Note, then one can hope they market the h_ll out of it. About freakin’ time, TMo. As for the OneS v OneX….it’s pretty sad that TMo has to try to pass off the OneS as a worthwhile alternative to the OneX ( other than having to bind yourself to ATT to get it ). Now, if somene did to the OneXL what they’ve done to the Note ( flash radio to get TMO HSPA+ )…..then I can see a lot of folks moving over. If the OneS had a uSD slot, that might push someone over the edge. But this whole move to remove uSD slots to go to Cloud is a JOKE ! You think accessing you stuff is slow coming off a Class 6 or 10 uSD ? Just tie yourself to the “Cloud” ( it’s the INTERNET, hello ?!? ). I have the galaxy note already. I unlocked it to work with my T-Mobile service since I hate AT&T. If this comes to T-Mobile, I will have 2 galaxy notes. Lol. please make it so! i want this phone so bad!!! I saw a demo of this at AT&T. Cool as a mini tablet but a total freak show to be used as a phone. To each his own though. I’d rather have the GS3 or Lumia 900 on T-Mobile then the SG Note. If its true then I’m finally using my upgrade! I’ve been off contract since 2009. Upgraded to the SGSII at the begining of this year..I really wanted that galaxy note men! Now this! The universe hates me! Really?? Buy an unlocked one then if you want it so bad. They can be found for about $450 now. Where ? Looking around Craigslist and Ebay practically everyone wants a ridiculous $575 or higher…every so often you’ll find a $550 thrown in there, but it’ll have scratches on the screen or something. Post a link if you have one, man. I am hoping and wishing that this is the case. Have the Galaxy S 2 now. Love it! Debated on Galaxy 3, but if the Note is coming, I’m all over it!! I’ll try to contain the excitement, but it this ends up true, I might just choose this over the GS3… I’ll want to check out the specs and play around with both first or maybe I’ll just get both. Either way, Samsung just shut up and take my money. It is an awesome phone I have the AT&T version rooted and romed for T-mobile. If they get this it would be the first HD phone in their lineup. 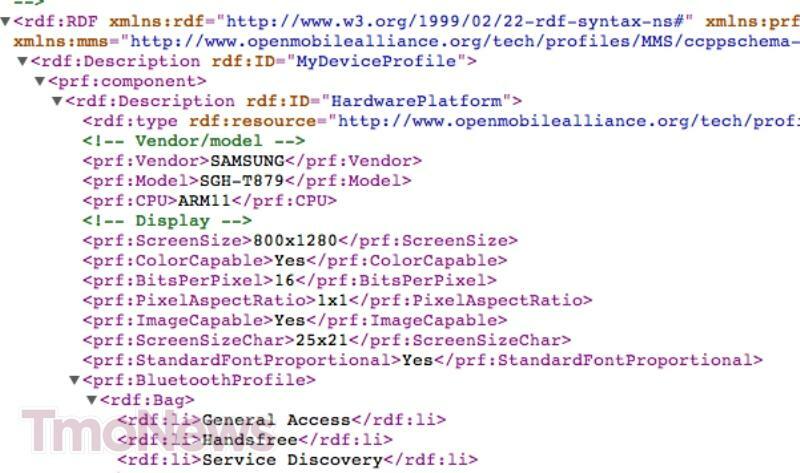 Could be the FCC filing for the Galaxy SIII as well since its going to be announced in a week or so. I would take a Nexus over a “look at me” Note. I would take an SD card Slot over Cloud storage. Stick around Wilma, I have a feeling T-Mobile USA is about to start playing hardball w/ its devices. I am Lol mainly it’s dis HD2 and you already know how that device has been to me Lol. Next Month should be the debut of the new Tmo seeing as how the GS3 and the Tizen event are both scheduled for the beginning of May and Tmo has to be getting some of that action. Hurry up tmobile and announce the Note’s arrival so I can enjoy all of it’s 5.3″ goodness!!!!! Finally I can use my upgrade!!!!! I think that t-mobile will get a lot of new and exciting phones this year. I think they are a little late to the game because they thought they’d be bought, but I look forward to what they do. But it will be hard to jump at any particular phone until I see all the options. I mean, if they get the note, I’d want to see the Galaxy S3 as well before purchasing. Also, I’m interested to see if Tmobile gets a Lumia 900, as my wife has a Radar. Should be an intersting year. We may even see Blackberrys new 10 devices. I have read several articles saying that tmobile officials, speaking on condition of anonymity, have said tmobile will be getting a variant of the Lumia 900 early this summer. :-) Although I’m tempted to wait for WP8 devices to come out so I get the dual core processor with the greatly upgraded OS. I had the unlocked version for a while, but couldn’t stand the edge speeds on my 30/mth 4G prepaid plan. I also don’t like the logos on front of the AT&T version. This phone is amazing. I also had the BLU Studio 5.3 which was nice, but outdated technically. If the Note comes to T-Mobile, forget about every other phone that came & will come in the next 6 months, except the iPhone 5 lol. Galaxy Note & T-Mobile 30/mth 4G prepaid!!! I’m probably going to wait for the SG3 news to make any move on a phone. I just hope the SG3 release isn’t like SG2 where it was out in Europe 6 months before it got to the USA. If its going to be like that I’m just going to pick up the Note. How do guys carry these large screen phones? I dont have enough room in my pants! I understand girls with purses or guys with briefcases but dont understand how guys use these big phones for casual use? I have problems w regular sized screens. guys shouldn’t have a problem. I wear normal jeans at home and work pants during working hours and I use the t989. I have plenty of room even with a case. I can’t see the note being a problem. A 7″ tablet is too big or else I’d want a phone in that. Use an earpiece for calls. I can’t imagine sitting down with this phone in dress slacks like I do.. You’d see the outline of it all day in my pocket lol maybe jeans would be better but id have to carry it in my jacket pocket all day which i don’t think many of you would be a fan of either. These type of phones are only slightly larger than your average 4.3″ phones, its really not that big of a difference. I could see girls having issues fitting it in their jeans, or those fruity men who wear “skinny jeans” (I guess they can fit it in their man purses). There is almost no bezel on it and the difference is so small between it and a 4.3 inch screen. I put my Sensation up to it and its much less of a size difference than you might think. false. proportionally, it’s a huge difference. if you’re talking about a car that you’ll park in your garage, then a couple inches is negligible. but for something that you hold in your hand and put in your pocket, this is a huge difference. I have small hands, so one-handed use is out for me. The Galaxy Nexus is the size that one-handed use ends at for me, and the Note is considerably larger than the Nexus. lol don’t tell me false, it is very true. The only false thing was your statement in size; “inches” is completely false. Listen I get it you don’t like it. Why do people feel the need to impose their likes on ALL phones. There are plenty of tiny phones out there so people can feel special, its ok that a few want to be larger. That picture says it all. Myth busted. Slightly larger than 4.3″ phone ?? You need glasses if that is “slightly larger”. Normal working men dont buy this phone. Lil boys looking to compensate buy it. It is more of a feminie phone anyways as it is easy to carry in a purse. Actually, we’re called enterprise users. Grownups wear belts, and we buy cases for our smart phones that clip onto said belts. Then we use them for keeping track of our projects, contacts and for reading our Kindle books. Exynos, yes. Snapdragon, hell no. I tried the at&t one, its so laggy on Web browsing and HQ YouTube video. This is great news. I would get note over GS3. Why the heck are they so late to the game with this?? because of stupid carrier exclusivity rights here in the US. ATT paid for exclusive rights. Because it was exclusive to AT&T only. Not a complaint but a question. I’d never want a Note, but it’s a good thing that tmobile is giving people what they want. Haha enjoy your sky high bill! Classic plans are just as high as AT&T when ur data starts at 5gb. I don’t know why you Tmo fanboys always act like T-Mobile is that much cheaper when its not unless you have Value or monthly plans. They all have the same stupid fees + taxes. Coming from someone who has both TMO and ATT, I can say feature-for-feature, TMo’s plan is about $45 dollars cheaper. ($95 vs $140) Yes I looked at the classic plans and don’t dare go over on ATT, cause they’ll charge you $10/GB if you do! It may not seem a lot, but that’s $45/mo; 540 bucks/yr that could be used for something else for people on a budget. Hell it’s almost the price of high-end phone, full retail if that tickles your fancy. I’m not a TMo fanboy, I’m just stating the facts. Johnny is right. Although I love T-Mobile and have had them going on 12 years, I also like Verizon and have an LTE hotspot through them so I’m familiar with all their plan prices. I’ll keep both services. The flipside is that since I’m eligible for a discount on AT&T, but not T-Mobile, my AT&T bill is cheaper than my T-Mobile bill. I happen to work for a company that gets me 20% off my AT&T bill. LOL. And the LTE is ridiculously fast. Faster than my Time Warner Cable at home. Instead of Samsuck, T-Mobile needs to bendover and do what they got to do to get the iPhone instead. This is what i want!!!!!!!!!!! This is good new for some I guess?? But this is not that great of a phone. I work with a guy who has one and for a 300$ it should be more impressive. The pen is a gimmick. It was MUCH faster to use the keyboard or the voice input..
you going to use the keyboard to draw? If this holds true then the Note will be a great addition to T-Mobile’s lineup. Note, Lumia 900, maybe GN. Lots of things to look forward. its about damn time that T mobile are stepping there game up. T mobile needs to make sure that they do what ever it is they have to do to get this phone and more hot phones as well. All I’ll say is – if it is the TMO GNote, I’ll be picking it up as soon as I can get my grubby little hands on it! Am currently persevering with an International GNote on TMO EDGE. It’s surprisingly usable, but has its moments of utter frustration. Everyone needs to claim down. Are you sure that Galaxy note? Then I would think her question is already well answered in the post. Those on Tmobile who want the GNote, why not just buy the international N7000? I’m using it on TMOBILE and while yes, I only get edge, its actually not all that bad, it loads up pretty fast. I don’t miss 4g at all and I also have the SGS2 and the Sensation so I know what 4g is, and 2g comes pretty close on the N7000 with Tmobile. Finally some good news for t-mobile, if T-mobile gets the Galaxy Note I’ll definitely buy it. Let’s hope it’s not a watered down version of the Galaxy Note, like how the Galaxy S2 was compared to it’s brothers. Regardless, i still might get it. WTH are you talking about? How was the T989 watered down versus the other versions? Elaborate. I’m sure that comment was in reference to the s3 snapdragon processor as opposed to the exynos….someone correct me if im wrong but i pretty sure the ATT note has the same s3 processor as the Skyrocket and our GS2. TMO’s Note will probably be identical to ATT’s (except for LTE compatibility)??? I’d buy some new khakis and some more big pocket Jeans along with a new contract for this baby! I will abstain from any other device till I have it….! Or my contract is up and I switch whichever comes first! LOL, I needed a new jacket recently. I made sure that it had plenty of big pockets for my phones! I buy phones off contract so I don’t have to worry about being tied to one… I’m not rich by any means, but I do splurge on full-priced phones every once in a while. When I don’t spurge, what I do is put money aside in my “new phone and tech piggy bank” and if there’s a phone (or tablet or whatever tickles my fancy) that comes out that I just gotta have, I break open this piggy bank and get it! As not to be a phone hoarder, I’ll list my old phones back on ebay, craigslist or sell it to places that buy back old phones. Though if it’s a phone that I don’t want to part with, or a phone that I want to keep to just develop roms and stuff on, then I’ll hold on to it. So I never have more than two, three phones at a time. My daily device, my backup device (cause you gotta have a spare just in case it breaks or something), and the device that I use to test new roms and such on. I’m sorry if you don’t know by now, but plans such as T-Mobile’s Value plan is cheap enough for you to set aside money for buying your off contract phone of choice. And have extra money left over. I mostly always buy all my phones unsubsidized, it’s rare when I take the discount. I usually get a new phone every 8 to 10 months. its just a preference. I came to T-Mobile as an Even More Plus customer, so all of my devices with them are at the full retail price. No, I’m not rich. But the plan does allow the freedom and low prices to be able to get new devices whenever I want one. Last year, I planned for which phones I wanted to buy this year based on new features and platforms that I wanted to try out. I set aside money for that so that I could buy the devices that I want. Phones are my hobby. Some people like to ski, attend sports events, or whatever. I like to buy phones. Look at how the comment board lights up when Tmo finally gets a true high end phone. Hopefully they get the Lumia 900 soon too. They’ve had a lot of “true” high-end phones (e.g. the HTC Sensation, HTC Amaze, SGSII). Even the Samsung Vibrant was high-end when it was first released. The horses always wear blinders. Wrong. I’ve looked at other carriers as well. Fun fact: the Thunderbolt and EVO 3D both have the same specs (excluding LTE and the screen) as the Sensation. I am referring to that everyone keeps saying that T-Mobile never has high-end Phones while they would have up to 3 or 4 of them staring them in the face. The one that kills me the most is that because the Galaxy SII in T-Mobile is considered trash because of the S3 chip, versus the sprint and AT&T withe the exynos. Ah. I agree. My apologies. Fast forward 90 days, will we have to chose between the Note or the S3? Now that is what I have been waiting for!! Cmon guys, there’s nothing the exynos can do that the snapdragon can’t. Also the snapdragon CAN support 42mbs and the exynos CAN’T so all the technical debates in the world won’t change that. Doesnt anyone think its a little to late? I mean I have been wanting the note forever to be on tmo network, but now I feel like they took to long….Next thing you know theirs a newer thinner galaxy s note plus. T-Mobile is killing me. It was hard enough thinking about the One S and the Galaxy S3, and what if they get the One X? I am tired of thinking about phones officially. I would scoop this Phablet up so quickly, they’d think I stole it… come on make it be true!!! I sure hope TmobileUSA gets a Samsung 5.3″ screen soon. While a sizable slice of the population considers the Note to be too large (i’m on the fence myself), it’s pretty clear that there is a market for this beast of a phone given AT&T’s sales numbers. It’s also been one of the most requested phones in the comments section here over the past several months. So I think it’s a smart move on T-Mobile’s part to pick it up. Just left Costco and although he Note thy had was just a dummy phone, I compared it to my tmo sg2 and kind of freaked out for a quick second at the size difference. I still want one but definitely will be using a Bluetooth for phone calls. I put it next to my ear and my wife cracked up. couldn’t this be the Samsung Galaxy SIII? I would love to see the Note for tmobile though! don’t overlook the posibilities of the Sammy Galaxy Nexus..
Samsung’s website shows that the available tablets carried by T-Mobile go by T849, T859 and T869. You would think the next tablet inline would be the T879. They do have a tablet coming out called the Galaxy Note 10.1 N8000 with specs of 1280 x 800, ARM processor and supposedly support for GSM voice communication, SMS, and MMS according to GSM Arena. I bought the ATT i7i7 Samsung Note and hacked into it for use with T-mobile, and got pretty fast 4g speed (about 9-10 Mbps) with my Tmobile sim card. One important matter though, it’s not very stable. So, I ended up selling the Note and rather wait for the official Tmobile Note to come out, or the Galaxy S3. Trust me, if anyone trying to buy the ATT i7i7 to modify to work on Tmobile, don’t waste your time. You won’t get stable 4g signal.